An alien who was admitted into the United States as an exchange visitor, or who acquired such status after admission, is not eligible to apply for or receive an immigrant visa or a nonimmigrant visa [H, K, or L]. unless: It has been established that the alien has been physically present in the country of the alien's nationality or last residence for an aggregate of at least 2 years following the termination of the alien's exchange visitor status. The reason in part this was instituted because this visa category is supposed to be an open channel of exchange of skilled and professional personnel between US and other countries. The agreement, so it seems is - to prevent trained professionals from leaving home country after training on either side, it was made mandatory for these exchange visitors to return to home country. What is a J1 waiver? There are certain exceptions which can be applied to the above stipulation of the 2 year home country return requirement. US department of state website mentions 5 criteria for waiver but in effect there are only four basic ones (Figure 1). Figure 1: Green arrows denote the vector of retention of J1 applicants. There is fear of persecution in home country for the applicant. Which factors are applicable to medical residency applicants? It is clear from above list that if your specialize or do a fellowship - the chances that you will find a waiver job will considerably go down. Think about this before you chose your professional career plans. The HPSAs can also be geographic (a county or service area), demographic (low income population) or institutional (comprehensive health center, federally qualified health center or other public facility). The complete list of HPSAs can be found at the Health Resources and Services Administration website. There are also a list of MUPs (medically underserved populations) and MUA (medically underserved which are eligible for waiver jobs. Applicants can also apply to these areas under the CONRAD 30 waiver program or under certain circumstances, the Appalachian Regional Commission (ARC)will request a waiver of immigration requirements for foreign-trained physicians doing residency work in the United States under a J-1 visa. 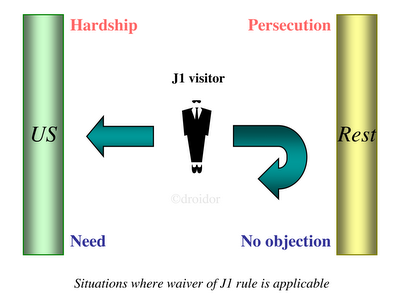 For the flowchart discussing the J1 waiver process check out at J1 waiver requirementmade easy. Click the like button to join me on facebook or follow on twitter! if there is fear of persecution in home country , is this considered application for asylum or there is another process for it?? what paper work needed for it? hello Dr. Garas, I am not at all versed in this aspect. It is best you seek counsel of a immigration lawyer or ask this question on a immigration forum. If you have a residency, match or USMLE related question, I will be happy to attempt to answer it. Good luck! Work positions in VA hospital grants a J1 waiver possibility? how about j1 visa under Trump's government ,for medical students to perceive residency in USA ?? ?